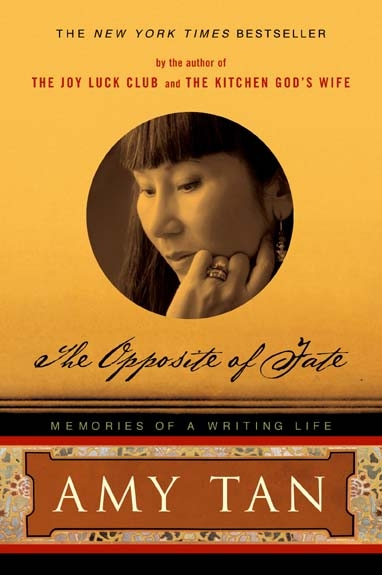 Amy Tan was born into a family that believed in fate. In The Opposite of Fate: A Book of Musings, she explores this legacy, as well as American circumstances, and finds ways to honor the past while creating her own brand of destiny. She discovers answers in everyday actions and attitudes-from writing stories, decorating her house with charms, learning to ski, and living with squirrels, to dealing with three members of her family afflicted with brain disease, surviving natural disasters, and shaking off both family curses and the expectations that she should become a doctor and a concert pianist. With the same spirit, humor, and magic that characterize her beloved novels, Amy Tan presents a refreshing antidote to the world-weariness and uncertainties we face today, contemplating how things happen-in her own life and beyond-but always returning to the question of fate and its opposites: the choices, charms, influences, attitudes, and lucky accidents that shape us all. "Sharp and invigorating—and precious—It is Tan's excursions into past lives her familys and her own that make for the most fertile reading. The cunning willfulness of memory is a powerful refrain in this book—In describing how we edit and manipulate memory, Tan produces some of her strongest essays. Tan's novels swim with memories transfigured by the pulse of her imagination the sorcery of writing fiction that she says many academics ignore. In the end, these essays ask, what does it take to construct and balance a life? For Tan, it requires engaging fate, both blind and blessed, with aggressive creativity and ducking from time to time into the big tent of fates alternatives: choice, chance, luck, forgiveness, forgetting the balm of love, a sturdy attitude trolling for miracles, a plea to others to throw a lifeline the whole shebang anchored by stubborn hope."